Modular, Manageable, Meaningful - help your students discover the life span. 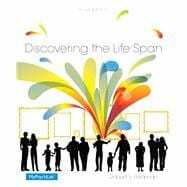 Discovering the Life Span, 3/e by Robert S. Feldman helps students truly connect to the material. Written in an engaging and accessible style and organized in a modular format, this title allows instructors to cover the entire lifespan without having to sacrifice content throughout their course. Students will get a better sense of the entire process of development and understand how the domains of development work together. Discovering the Life Span is a meaningful learning experience that prepares readers to apply content to their personal and future professional lives. MyPsychLab is an integral part of the Feldman program. Engaging activities and assessments provide a teaching and learning system that will help students master life span development. New features include the updated MyPsychLab Video Series for Lifespan Development, which contains a rich assortment of video clips including sketchnote-style tutorials as well as cross-cultural footage and segments featuring real students sharing their experiences. MyPsychLab also contains MyVirtualLife, an engaging variable-based simulation that allows students to experience lifespan development firsthand. Engages Students: Written in an engaging and accessible style and organized in a modular format, this title helps students connect with the material. With Pearson’s MyVirtualLife simulation, students can apply course concepts and truly engage with the material in a meaningful way. Improves Critical Thinking: Becoming An Informed Consumer of Development vignettes throughout the text help build critical thinking skills. Writing Space contains a variety of writing prompts that ask students to demonstrate scientific thinking about key course concepts. Explores Research: The third edition integrates new research and advances in areas such as behavioral genetics and brain development. Discovering the Life Span, Third Edition is also available via REVEL™, an immersive learning experience designed for the way today's students read, think, and learn. Learn more. Robert S. Feldman is Professor of Psychology and Dean of the College of Social and Behavioral Sciences at the University of Massachusetts Amherst. A recipient of the College Distinguished Teacher Award, he teaches psychology classes ranging in size from 15 to nearly 500 students. During the course of more than two decades as a college instructor, he has taught both undergraduate and graduate courses at Mount Holyoke College, Wesleyan University, Virginia Commonwealth University, in addition to the University of Massachusetts. Feldman, who initiated the Minority Mentoring Program at the University of Massachusetts, also has served as a Hewlett Teaching Fellow and Senior Online Teaching Fellow. He initiated distance learning courses in psychology at the University of Massachusetts. A Fellow of both the American Psychological Association and the Association for Psychological Science, Professor Feldman received a B.A. with High Honors from Wesleyan University and an M.S. and Ph.D. from the University of Wisconsin-Madison. Feldman is a winner of a Fulbright Senior Research Scholar and Lecturer award, and he has written more than 150 books, book chapters, and scientific articles. He has edited Development of Nonverbal Behavior in Children (Springer-Verlag), Applications of Nonverbal Behavioral Theory and Research (Erlbaum), and co-edited Fundamentals of Nonverbal Behavior (Cambridge University Press). He is also author of Child Development, Understanding Psychology, and P.O.W.E.R. Learning: Strategies for Success in College and Life. His books have been translated into a number of languages, including Spanish, French, Portuguese, Dutch, Chinese, and Japanese. His research interests include honesty and deception in everyday life and the use of nonverbal behavior in impression management, and his research has been supported by grants from the National Institute of Mental Health and the National Institute on Disabilities and Rehabilitation Research. Feldman loves music, is an enthusiastic, if not-exactly-expert, pianist, and he enjoys cooking and traveling. He has three children, and he and his wife, a psychologist, live in western Massachusetts, in a home overlooking the Holyoke mountain range.